EAST LANSING, Mich. (AP) — Two years ago, Michigan State and Northwestern combined for 94 points. Last season, they threw for over 800 yards. Their next meeting is this weekend, but both teams have issues that could prevent another shootout. Dantonio often keeps the Spartans’ injury outlook under wraps, so it’s not clear who will be available Saturday when No. 20 Michigan State hosts Northwestern, but both teams have room for improvement. The Spartans have been without running back LJ Scott for the past two games, and they lost receiver Cody White to a broken hand last weekend. The Wildcats have their own problems. They lost running back Jeremy Larkin before last week’s game against Michigan. Northwestern (1-3, 1-1 Big Ten) almost beat the Wolverines, but after jumping out to a 17-0 lead, the Wildcats were shut down and lost 20-17 . Northwestern allowed six sacks and finished with just 202 yards of offense. 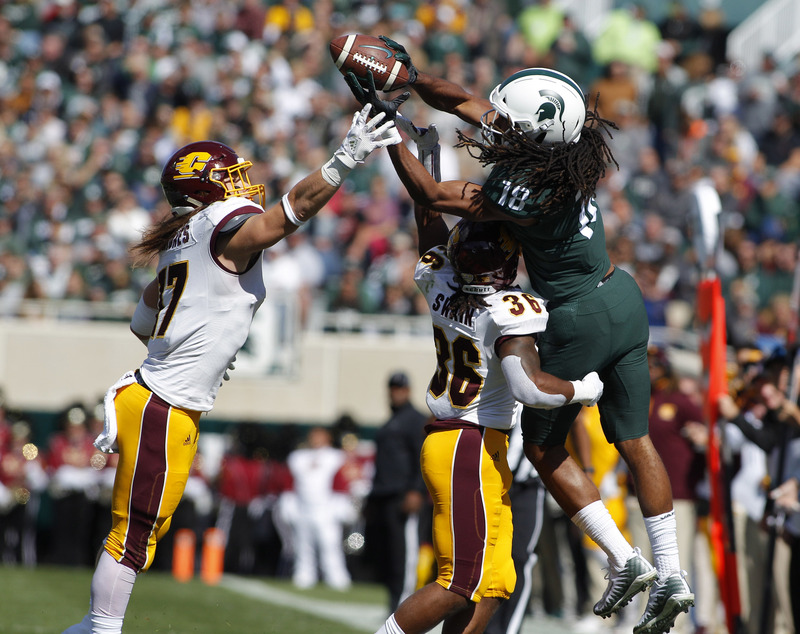 Michigan State (3-1, 1-0) beat Central Michigan 31-20 but went scoreless in the first and fourth quarters. The loss to Michigan was Northwestern’s third game this season decided by four points or fewer. Last year, the Wildcats won three consecutive overtime games, including a triple-OT victory over Michigan State. So they’re familiar with close finishes. The game two years ago in East Lansing was memorable as well, with Northwestern prevailing 54-40. Michigan State is No. 1 in the nation in rushing defense. The Spartans are allowing only 40 yards a game on the ground, and Northwestern’s running game doesn’t look too formidable without Larkin, who had to retire from football because of a medical condition involving his neck and upper back. The Spartans are hard to run on, but Northwestern has a capable passing game. Clayton Thorson has started 43 straight games at quarterback for the Wildcats, and receiver Flynn Nagel has a 22-game catch streak. With White injured, Felton Davis is Michigan State’s most accomplished receiving target. Quarterback Brian Lewerke may need to look to him even more often than usual. Lewerke threw for 445 yards and four touchdowns in the loss to Northwestern last year. Thorson threw for 356 yards and two TDs. Michigan State’s Matt Coghlin has made his last 14 field goal attempts. The school record is 15 in a row by Brett Swenson. There’s some evidence to back up Fitzgerald’s claim that the Wildcats don’t beat themselves. Northwestern has only 13 penalties on the season, tied with Navy for the fewest in the nation. However, the Wildcats have a minus-1 turnover margin, and they only have four takeaways. Northwestern may need to be more opportunistic if it’s going to upset teams like Michigan State.